Artists these days are very concerned with budget. It’s not uncommon for an artist to have to provide all the financing. Labels are pretty defunct. If you happen to land on a cool indie label, they still may not cover recording/production costs. This means there’s an awareness one must have in the current record making environment. Especially when artists are using Kickstarter to raise a defined amount of money. As a producer, you should have a solid understanding of the costs for every stage of a project. The artist is going to come to you with an idea of what they want. Often, they don’t have an understanding of the budget to realize their dream. Let’s discuss how you should calculate budget estimates for an artist. We all know about studio rates. It’s the most obvious cost for making a record. 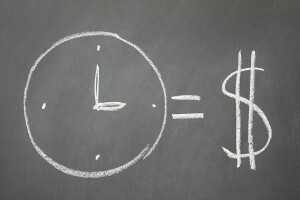 When calculating time for a session, make sure to add a little extra. The stress that is created by a cramped session doesn’t help the project. It takes time to set up and get sounds. Estimate this time and every changeover. You don’t hit the record button when you walk in the door. So why start counting time like you do? Add that extra time into the budget. You’re going to need it whether you realize it or not. Better to know upfront. It costs money to get great musicians on your record. Here’s something to consider when picking musicians for an album or session: Even though a higher caliber musician may cost more money, they will likely save you money. How can that be?! Because a seasoned session player can nail parts in a few takes. A less experienced player will need many more takes and also possibly editing. Here’s the math. Let’s say you hire the best drummer and he’s charging $100 per hour. Let’s say the studio is also $100 an hour. Now, let’s say our lesser experienced drummer is $50 an hour. The great drummer can nail a take with a couple passes. That’s usually about an hour after sounds are set. No editing needed! The cost? $200 for the musician and the studio. The less experienced musician will take longer then an hour. They might not be as good locking to a click or remembering the arrangement. Let’s say it takes them 2 hours plus some editing (which we’ll call a half hour of time). That’s 2 1/2 hours total. The cost? $350. So even though the top cat asks for more money, it saves you money. Knowing how to stagger the arrival of musicians can save you money. Having the whole rhythm section there while you’re getting drums sounds is a waste of money. Have musicians show up based on complexity of setup. This usually means the bassist can be last.